^ quoted in James Swenson, On Jean-Jacques Rousseau (Stanford University Press 2000), p. 163. ^ Lettres de la montagne, quoted in Swenson (2000), p. 164. See also: Patrick Riley, The General Will before Rousseau (Princeton University Press, 1988) and Mark Hulliung "Rousseau, Voltaire and the Revenge of Pascal" in the Cambridge Companion to Rousseau, edited by Patrick Riley (Cambridge University Press: 2000), pp. 57-77. ^ See Maurice Cranston's introduction to the Social Contract, Penguin Classics, 1968, pp. 9-42. ^ for Spinoza's mens una, see Jonathan Israel, Radical Enlightenment (Oxford University Press, 2002), p. 274. ^ Joseph Reisert. General Will. (编) Bevir, Mark. Encyclopedia of Political Theory. 2010: 551–553. ISBN 1412958652. ^ David Lay Williams. 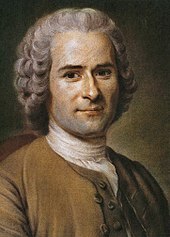 Rousseau's Social Contract: An Introduction. Cambridge University Press. 2014: 1-2. ISBN 978-0521124447. ^ George Crowder. Isaiah Berlin: Liberty, Pluralism and Liberalism. Polity. 2004: 61. ISBN 978-0745624778. ^ For a rejoinder to Talmon see R. A. Leigh, "Liberté et autorité dans le Contrat Social" in Jean-Jacques Rousseau et son oeuvre, (Paris, 1963). ^ See the "Nicolas Malebranche" entry in the Stanford History of Philosophy (revised 2009). ^ Diderot: Political writings: Cambridge Texts in the History of Political Thought, edited by John Hope Mason and Robert Walker (Cambridge University Press, 1992), p. 20. Compare Rousseau: “Cast your eyes on all the nations of the world, go through all the histories. Among so many inhuman and bizarre cults, among this prodigious diversity of morals and character, you will find everywhere the same ideas of justice and decency, everywhere the same notions of good and bad” (Emile, 288, [IV 597-98]). ^ The Social Contract, Book IV, paragraph 4. ^ The Social Contract, Book IV, Paragraph 6.